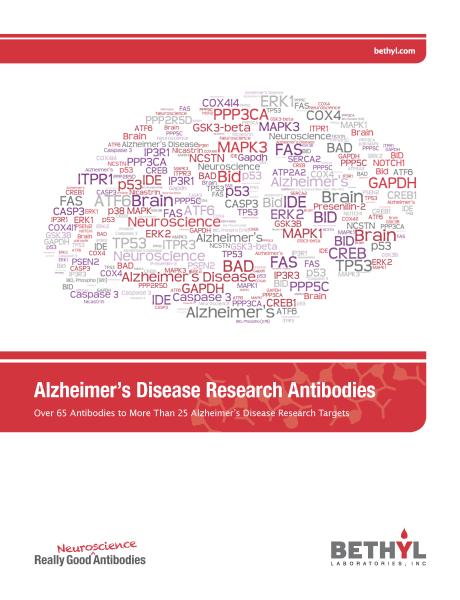 Get to know 65 antibodies to more than 25 Alzheimer´s disease research targets. Released March 2015. 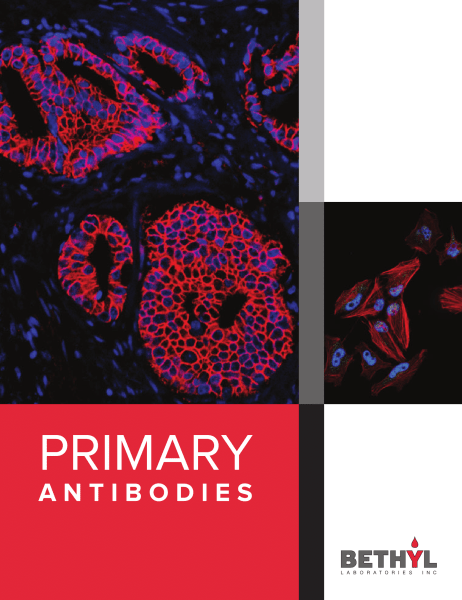 The 2014 Primary Antibody eCatalog features over 5,000 primary antibody products that have been tested by Western Blot, Immunoprecipitation, Immunofluorescence, Immunohistochemistry, ChIP, Flow Cytometry, ELISA or Proximity Ligation Assay (PLA). Eptiope tag antibodies are also listed. Updated April 2014. 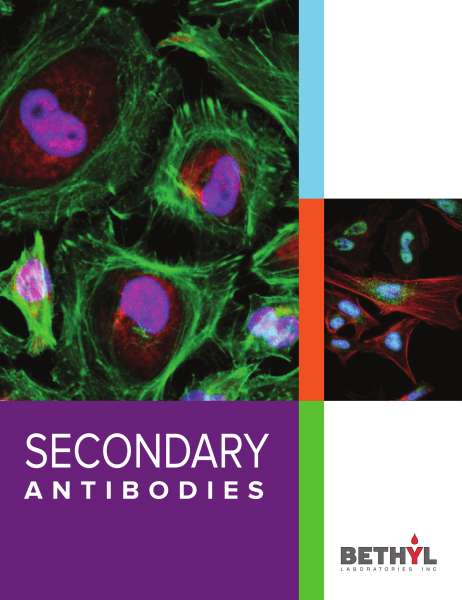 The 2014 Secondary Antibody eCatalog features over 1500 antibodies to 27 species, in 6 hosts, and 18 different conjugations. Bethyl utilizes the following conjugates in the secondary antibody manufacturing process: agarose immobilized, alkaline phosphatase, biotin, Cy2™, Cy3™, Cy5™, Cy5.5™, DyLight® 350, DyLight® 488, DyLight® 550, DyLight® 594, DyLight® 650, DyLight® 680, DyLight® 755, DyLight® 800, FITC, Horseradish Peroxidase, and R-Phycoerythrin. Updated April 2014. The 2014 ELISA eCatalog features 25 different milk and serum proteins across 10 different species. 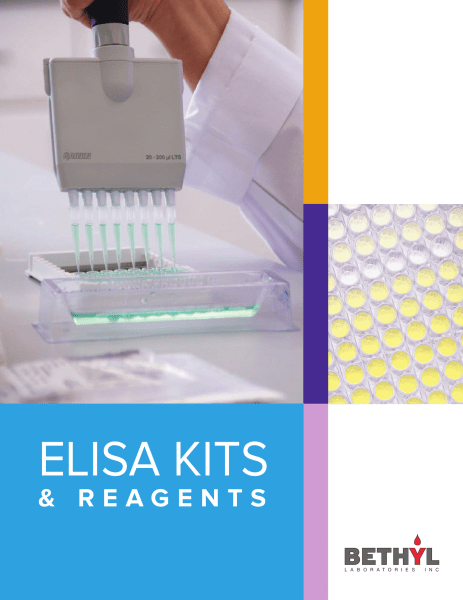 Bethyl produces complete ELISA kits that include all reagents and supplies required. Bethyl also produces ELISA sets that simply contain an antibody, calibrator and conjugate; the researcher provides all other supplies to complete the assay. Updated April 2014. 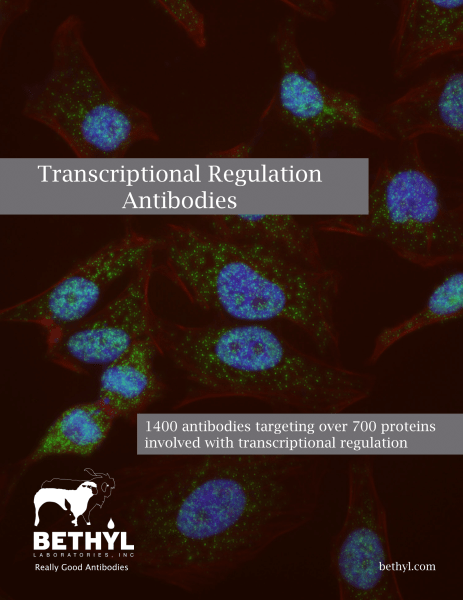 1400 antibodies targeting over 700 proteins involved with transcriptional regulation. Released February 2014. 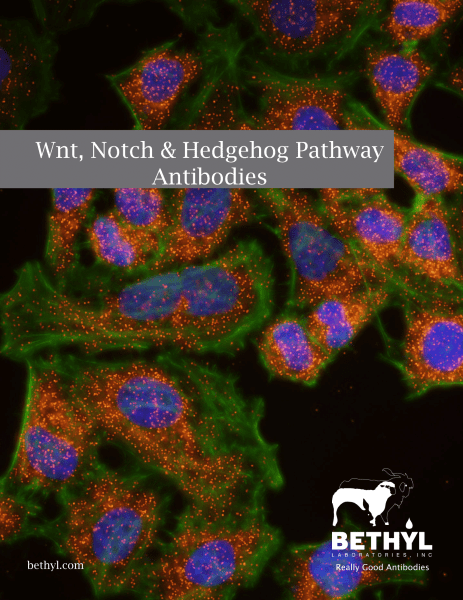 Bethyl offers over 400 antibodies targeting proteins in the Wnt, Notch and Hedgehog signaling pathways. Released February 2014. 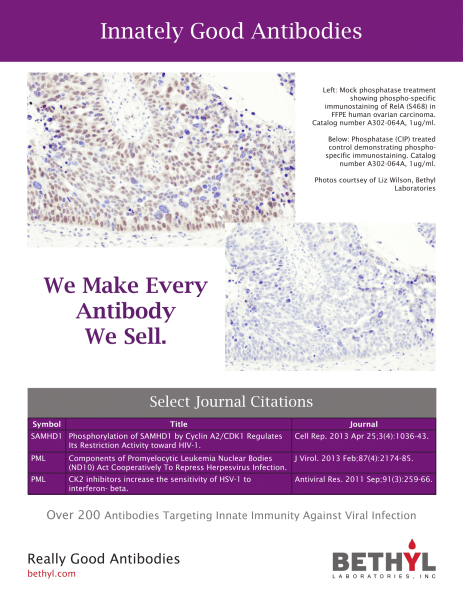 Over 200 Antibodies Targeting Innate Immunity Against Viral Infection. Released January 2014. 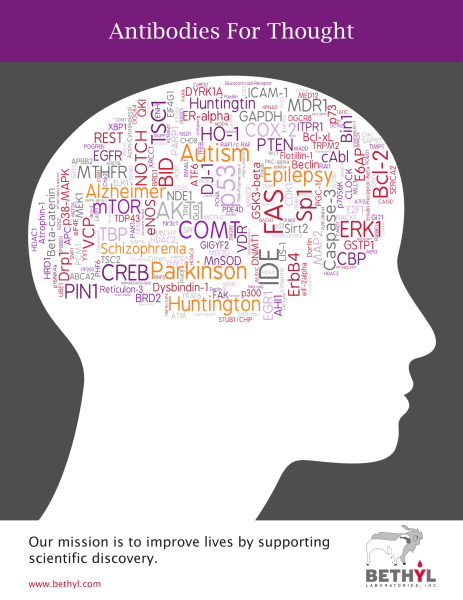 Bethyls most popular antibodies targeted toward neuroscience. Released October 2013. 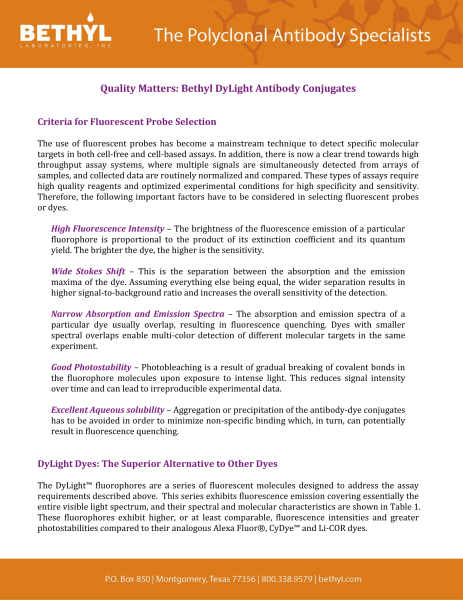 The use of fluorescent probes has become a mainstream technique to detect specific molecular targets in both cell-free and cell-based assays. Released June 2013.